Septic pelvic thrombophlebitis (SPT) is a rare and severe entity, which may occur after abortion, delivery, gynecological diseases, or surgeries. Diagnosis is challenging when no risk factor is clearly present, since clinically, symptoms are non-specific. Nowadays, with the aid of imaging methods, diagnosis has become more achievable, but the treatment still bears some uncertainties. The authors present a fatal case of SPT in a young woman who sought medical care already presenting signs of septic shock, referring fever and non-characteristic abdominal pain. The patient evolved rapidly to multiple organ failure and respiratory distress, which was also due to septic pulmonary embolism. 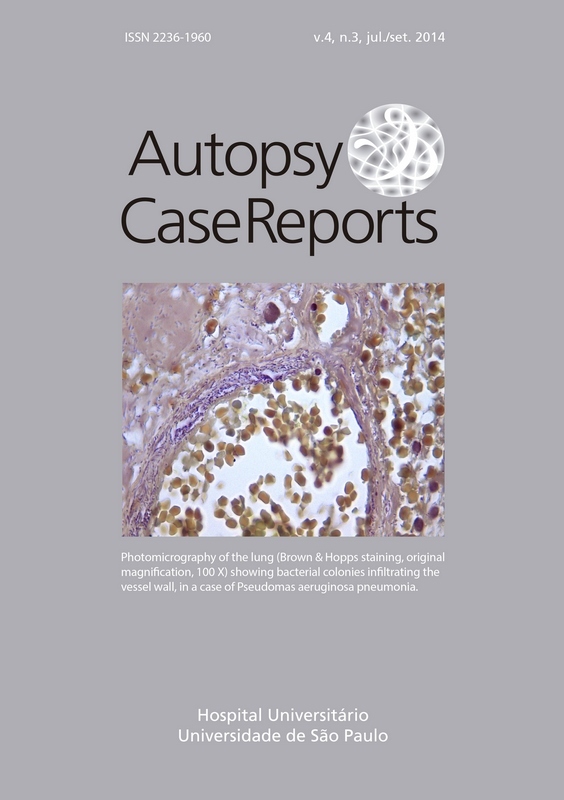 The autopsy confirmed the computed tomographic findings of a right ovarian vein septic thrombophlebitis and multiple septic pulmonary embolization foci. The patient did not present any of the recognized risk factors; neither did she present signs of pelvic inflammatory disease on admission or at autopsy. However, an intrauterine device was present. The authors call attention to this entity in the differential diagnosis of a woman with fever and abdominal pain, as well as for an empiric broad-spectrum antibiotic regimen in these cases.